In June 2018 FREO organized a series of three lunchtime concerts on the 1868 Henry Erben pipe organ. The instrument is in need of conservation and restoration, so it is not a concert-ready instrument. However, enough is operational to do some short recitals and play around some the deficiencies. 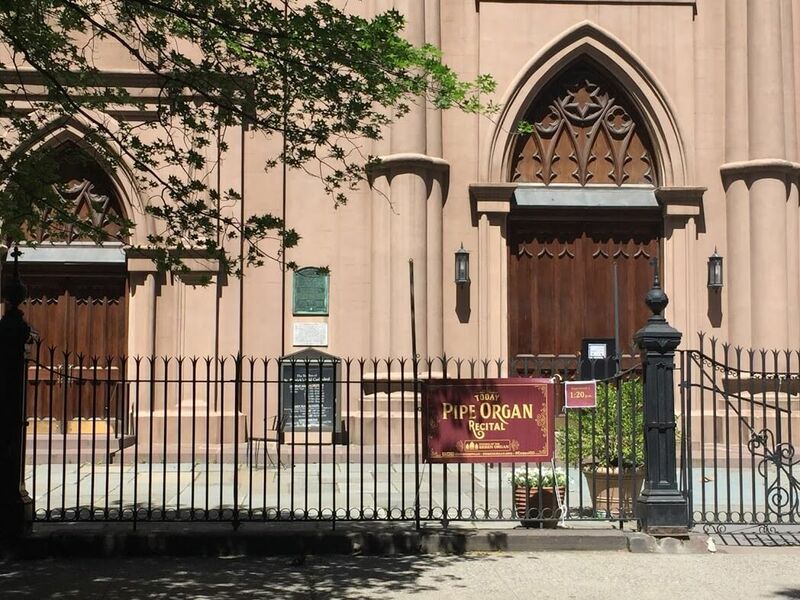 We wanted to draw attention to the beauty and the potential of the Erben — it is still used daily in liturgy, practice, and tours, and its working ranks of pipes still ring out with its unique 19th-century sound. New York City organist Maria Rayzvasser opened the series. 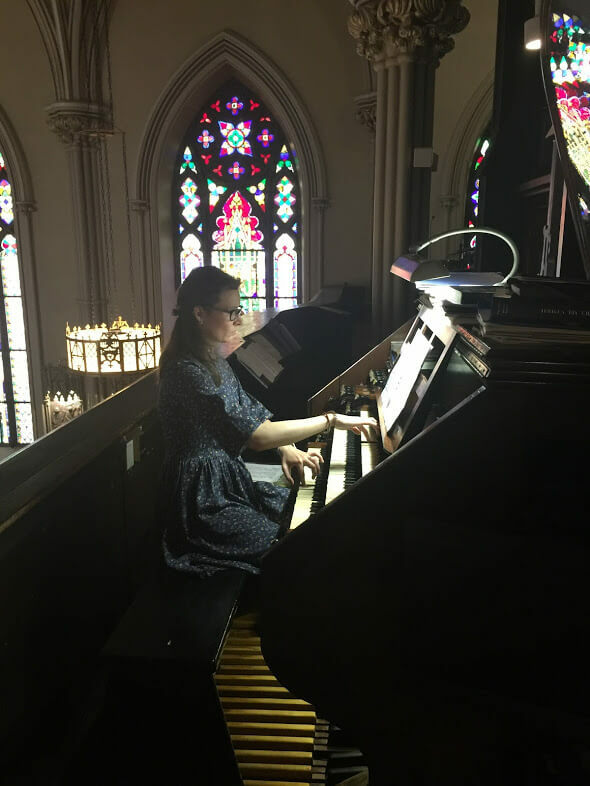 Maria is Music Director and Organist at Bethlehem Lutheran Church in Bay Ridge, Brooklyn. Maria gave a virtuosic program of Bach, Schumann and Mendelssohn. This program really stretched the current capabilities of the 150-year-old instrument, but we are grateful it held fast. Maria’s program was: J.S. Bach, Ich ruf zu dir, Herr Jesu Christ from the Orgelbuchlein; Sketch for Pedal Piano by Robert Schumann; and the Third Sonata by Felix Mendelssohn. 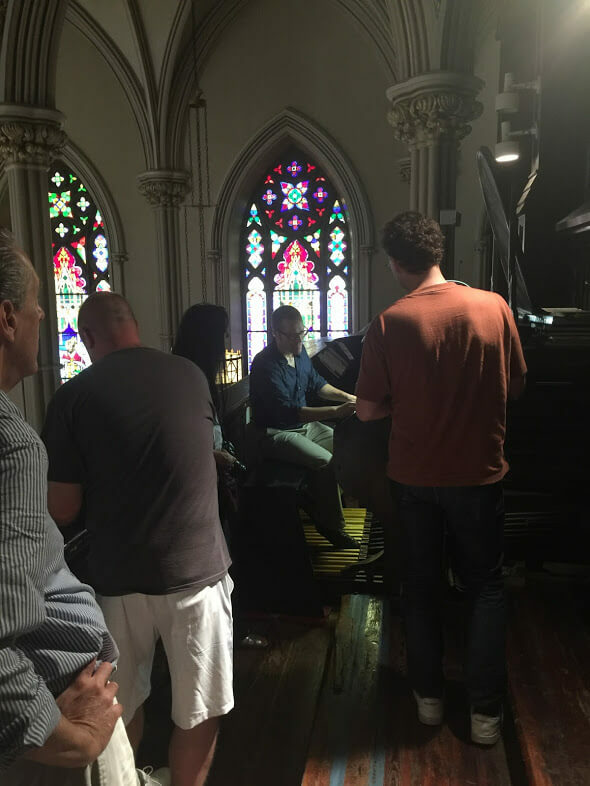 Voice of America visited the Basilica to do a feature on the Erben and interviewed Maria and Jared Lamenzo, Director of Music and Organist at the Basilica, for their segment. They also created this amazing video showcasing the Basilica and the Erben organ, played by Jared Lamenzo. Next up were Lana Krakovskiy, organ, and Roman Golovanov, baroque trumpet. Lana is a longtime friend of the Erben, having had performed on the organ several times over the last 8 years. 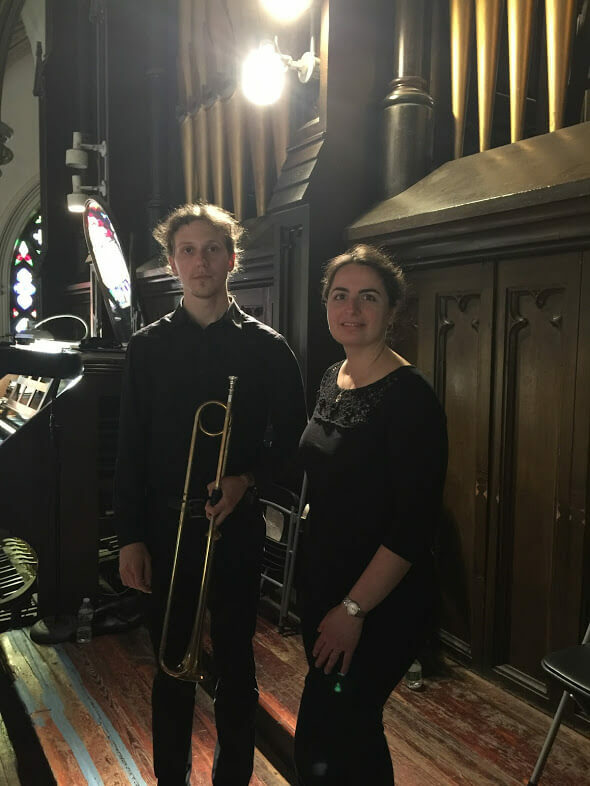 She was joined by Roman for a program of Purcell and Biber trumpet sonatas, rounded out by organ solos by Bach and Elizabethan keyboard composer John Bull. After the recital, Roman talked about his unusual brass instrument and showed it to the visitors. 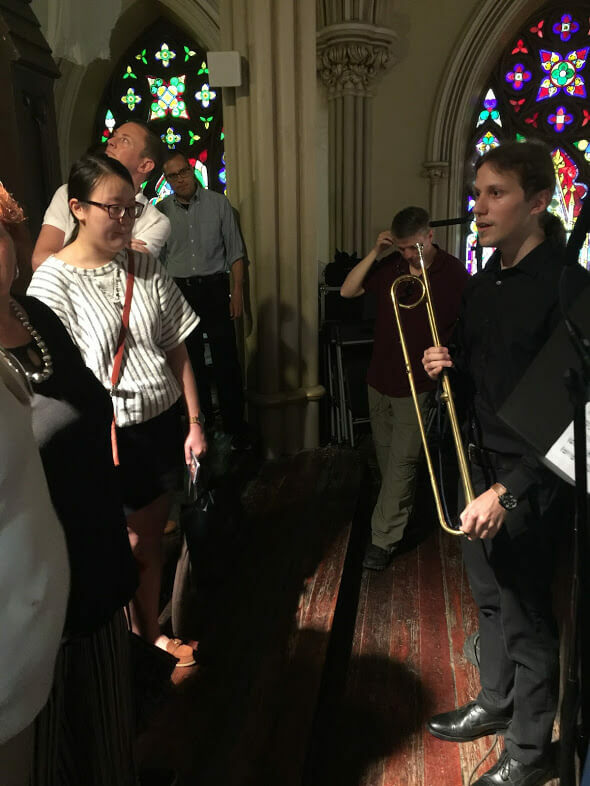 Roman describes his historically-informed baroque trumpet to the concertgoers. Our Basilica Organist and Director of Music, Jared Lamenzo, played the final recital. He offered Prelude in E minor by Dieterich Buxtehude and the impressive Sonata No. 4 by Josef Rheinberger, which ends with a dramatic chromatic fugue. 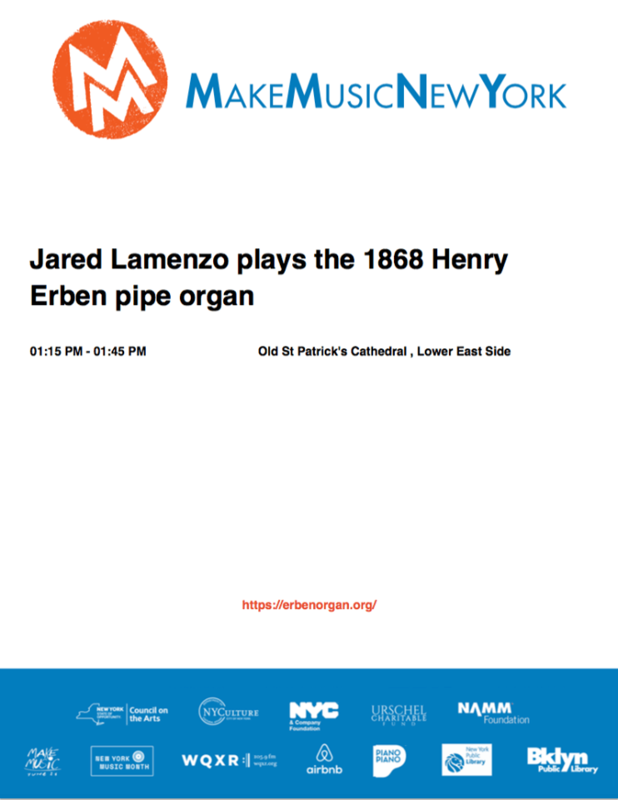 Jared’s recital also coincided with Make Music New York day on June 21, and ours was the only pipe organ recital participating in the city-wide music fest that day. We will have more recitals later this year as well to continue the celebration of the instrument’s 150 years of music! Make Music New York event poster featuring Jared’s recital on June 21, 2018.